BUFFALO, N.Y. -- Tired of the rain? Check out this week’s indoor events and stay dry! Tuesday, November 6, noon to 1:00 p.m. Horizon Health Therapy Dog Workshop hosted by Weigel Health Promotions. A therapy dog will be present to pet throughout the program. For more information, please contact Weigel Health Promotions at 878-3786 or 878-4719. Tuesday, November 6, 12:15 p.m. Artist Jared Thorne will deliver the talk “Every Day Contains All of History.” His lecture kicks off the photography exhibition In Place of Self, with fellow artists Patrice Aphrodite Helmar, S. Billie Mandle, and Aaron Turner that opens Wednesday, November 7, in the Czurles-Nelson Gallery. The opening reception for the exhibition, which runs through November 29, will be held on Tuesday, November 6, from 5:00 to 7:00 p.m. at the gallery. Both events are free and open to the public. For more information, visit czurlesnelsongallery.buffalostate.edu/. Tuesday, November 6, 7:30 p.m. The Percussion Ensemble will perform under the direction of Mark Hodges, lecturer of music. The West African Drumming Ensemble will perform under the direction of Tiffany Nicely, lecturer of music. Using djembes, dundun drums, and iron bells, the ensemble performs traditional music of the Mande ethnic groups living in Guinea, Mali, Senegal, and the Ivory Coast. For more information, call (716) 878-3005 or visit music.buffalostate.edu. The concert is free and open to the public. Wednesday, November 7, 4:00 to 5:30 p.m. This film explores the migrant child and family crisis during the summer of 2018. More than 2,000 families crossed the border unlawfully, looking to escape violence in El Salvador. The documentary explores one family’s journey. A discussion following the screening will focus on child advocacy. Sponsored by the School of Education, Professional Development Schools Consortium, and the Center for Excellence in Urban and Rural Education at Buffalo State. Wednesday, November 7, 6:00 p.m. to 8:00 p.m. The "Who am I?' and "Who's in Charge of Me?" Learning Communities are sponsoring this campus panel event. Come and learn how you can start research on your family roots, who you are, and where you come from. Light refreshments served. Wednesday, November 7, 8:00 p.m.
Based upon Alice Walker’s novel, The Color Purple tells the story of a poor African American woman in the rural South who finds love and the importance of her own voice. Follow-up performances November 8–10 at 8:00 p.m. and November 10 at 2:00 p.m. Tickets can be purchased online or by phone (716) 878-3005. The Buffalo State community will honor campus veterans. Marchers, including include past and present service members, their spouses and dependents, and first responders, will assemble at 11:45 a.m. at Chase Hall. The march will proceed to the Student Union Plaza at noon, where a ceremony will begin at 12:10 p.m.
Thursday, November 8, 7:00 p.m. to 9:00 p.m.
Join the African American Students Organization for a paint night. Tickets can be purchased for $5 at the business office in Campbell Student Union 404. RSVP. 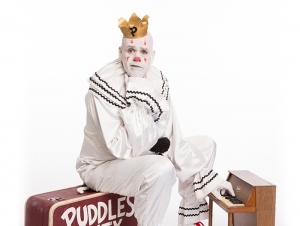 The "Sad Clown with the Golden Voice" is here with his heartfelt anthems and a suitcase full of Kleenex! This Pity Party is not all sadness and longing. The show is peppered with a brilliant sense of the absurd, mixing lots of humor with the awkward, tender moments. For tickets or more information, call (716) 878-3005, or visit the Performing Arts Center site.